Jean-Baptiste-Camille Corot was a nineteenth-century French painter and printmaker best known for his landscape paintings executed outside in the open air. He was highly influential to many of the French Impressionists. 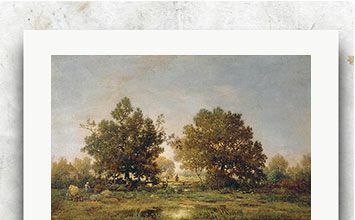 A leading member of the Barbizon School, Theodore Rousseau primarily painted landscapes, and the forest of Fontainbleau in particular. He was able to infuse with emotion and character into his canvases, leaving the viewer with the impression of the power and mystery of nature. Charles-François Daubigny, born in Paris to a family of artists, was a landscape painter best known for his riverside scenes. Daubigny was a member of the Barbizon School, a group of artists who preceded and influenced the Impressionists, and a friend of both Paul Cézanne and Claude Monet.